Subjekt-17 wanders Tibet, disguising himself from the local populace. He listens to the thoughts around him and even there they know of Superman. In his Fortress, Superman examines Power Girl with one of the Auctioneer's scanners. She reads as a non-Kryptonian, and Superman is no closer to figuring out who the third Kryptonian on the planet is. He briefly considers Krypto, but even if the dog counts, he hasn't seen him in over a year. Superman thinks of the dangers he's been facing, but eventually begins to worry about the future that Arion showed to him. Clark debated whether Superman might actually be a danger with Jimmy and Perry, and while Jimmy couldn't believe it Perry conceded that Superman might be doing too much for humanity. Superman stops by the Daily Planet to help repair the globe that was damaged in the fight with Bizarro, before heading to Zatanna. She checks him for any mystical residue, but gives him a clean report. He asks her about Arion and she tells him what she knows. Superman heads east to Iran, where he tracks down Sirocco. 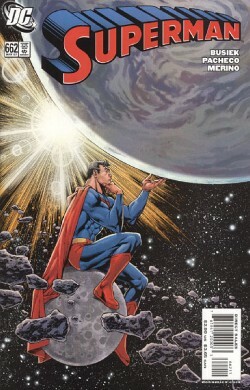 Superman asks about the source of his powers, but Sirocco lies about his origins. Then he asks about Khyber, and Sirocco tells him that Khyber is dead. Lois reads Chris a story, but when she looks out the window she calls for Clark. Dozens of flying people are soaring over Metropolis. Story - 5: I've already stated my love for this storyline in previous chapters, and it continues here, but what I really like about this issue is the continuity it brings. In this issue we see follow up to the three Kryptonians mentioned in the Auctioneer arc, a mention of Krypto's disappearance, follow-up to some of the recent battles in Superman, and even the Bizarro fight and Chris Kent from over in Action Comics. I really miss the interconnectedness of the titles back in the 90s, and this brings a lot of that back while still leaving each writer free to tell his own story. I really like the pacing of this arc too. It's moving along slowly, but it doesn't feel dragged out, it feels like its developing at the right pace. Of course, the fill-in issues interrupt the whole thing, but that's a whole different issue. When they announced the new creative teams a year ago, I wasn't that excited about Busiek coming on the book. His JLA arc a few years back had soured me on his work, but he has throughly proven me wrong with this fantastic arc. Art - 5: More great stuff from Pacheco. Most of it is his standard great work, but a few panels really shine this month. The splash of what I can only presume is a dead Metallo in the future was gorgeous. It managed to wrap up everything we saw in that fantastic future issue in one simple image. And Pacheco really has a great sense of perspective, both in the aforementioned Metallo scene and the panel of Superman carrying the Daily Planet globe. By viewing from behind Superman, and letting the buildings stretch up toward the reader it changes what could be a standard flight scene into something dynamic. I think my favorite page though, is Superman walking along the bottom of the ocean. I'm sure Busiek deserves some of the credit, because he most likely scripted the scene, but it's just a great addition to an exposition page that could easily have been visually boring. And as always, the coloring continues to be top notch in this book. I think that is what has really made Pacheco's art pop. He's a good artist regularly, but in this book his art is just stellar. Cover Art - 4: I love this cover. The concept is a fantastic one, and it actually works in the execution. It just such a simple idea, to have Superman literally considering the planet in a story about him possibly dooming the planet. It falls just short of perfect, and I think that's because it looks a little to plain, and I'm still not crazy about the use of the moon, but overall its a great image.